In the 8 years that the Super A was produced, 94,001 tractors were manufactured. You can locate the serial numbers on the right side of the seat support bracket. Here are the serial numbers associated with the years. My father has a Super A… the engine block is casted with the word sample on it. Any idea why this is? I have a Tractor A or Super A, serial number 29266. Can anyone tell me if this is an A or Super A and what year was it made? Thanks. @melbie : According to that serial number it would be a year 1950. Looking for a disc harrow. For a SuperA tractor the toung from the disc hooks on to the swing drawbar. the standard drawbar and the half moon drawbar.The chains hook from the lift arms to the disc with the lift arms let all the way down. Lift the arms up and this picks the disc up. Hope i havent confused you to much. Thanks. I have a 1949 Super A, did they ever make a bush hog that would work with this tractor? My husband is trying to plant corn but the sprocker (sp?) slips and plants more corn than it should. I have a Farmall A. The seat has been changed so I don’t know what year it is. is there any way to find out the year from numbers on the engine or transmission. I know most if not all of them are casting numbers but will they work. 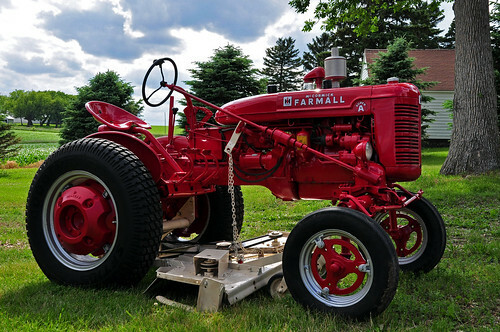 Have a Farmall Super A, missing the 3-5′ long link between hydraulic arm and fast-hitch. any suggestions? Have Super A Farmall which has 12 volt alt on tractor thats not hooked up. Any suggestions on the best way to put a chevy alt on, and hook up? Put a 1 wire general motors alt on it— you need to add a field flash switch so you can energize the fields after you start the engine to get the alt to produce elect. I have a Farmall Super A and I am not sure what year it is. There is no serial number plate under the seat. Where can I find a serial number on it? Can anyone tell me where to find out how to put a plow on a Farmall A? I own a 1949 Super A and need parts for the one-row cultivator. Does anyone have any suggestions? Thanks, Ben. Hi Ben, I would try ebay or your local Case IH dealer. They might be able to special order what you need, or know someone that has what you need. I have a super-a-farmall modle-faa sn.354115. Does anyone know how to tell year and mo. of mfg.? I have a 1953 Super A. I would like to slow it down, different ring and pinion I would assume. I do not want to change tire size, that will not be enough. The gearing is so high that under any type of load it just spins the tires. Suggestions? Looking for where to purchase decals super a Farmall. Any ideas where to find? THANKS. Just bought a 1947 Super A. Looking for plowing attachments. Any help would be appreciated. Email wmaultsby@gmail.com. I have a Super A tractor that will not idle. It runs almost wide open all the time, can anyone help? Thanks. Hi Harold, I would check the springs on the weights on the governor. It sounds like a problem in the distributer to me. Does this has an internal governor in the distributor or an external governor in the engine? Either way I think the weights are flying out too fast and allowing the engine to over rev. The tractor may have been over-revved at some point and the weights may just be stuck out, or they could be stuck from just sitting around and gotten rusty or sludge build-up. Looking for a Farmall Auper A fast hitch, 1954 model. I need to time a Super A Tractor engine. Can anyone tell me how to time it at the distributer? I have a Farmall Super A, I believe it is a “53”. I can’t seem to locate an inner tube for the front tire. I have tried three inner tubes and in each case the valve stem twisted upward and broke when inflated. Also, the tire size is not original, it is a 5.90-15 in lieu of 5.0-15. Does anyone know where I can get an inner tube that will work? Wanting to purchase either Farmall A, Cub or Super A. Take the number one plug out, put your finger over the hole. Have someone turn the engine over with the crank until the compression blows by your finger. Stop, stick something in the cylinder hole, bring the piston to the top. Pull your disturb cap off and look to see were the roter button is pointing. That will be number 1 wire going clockwise. Find the firing order, should be behind or close to the disturb. Follow that order, like 1354. Hope this helps. I have a 1950 farmall serial #296649. Under the serial number on the tag there is another number 1540. Does anyone know what the 1540 stands for? Looking for a Farmall Super A fast hitch assembly. How much does a 1949 Super A Farmall weigh? I’m looking for a seat for a Farmall 130 either the pan style or lowback rest style. I am looking for a super a in good condition. Mower a plus. I am from Pittsburgh pa area. 7248847847. Thanks. Farmall Super A tractor w cultivators for sale. Serial #342035 1953. Original operators manual. It was my Grandfather’s. Needs new tires and battery. Pulled and started when moved to another barn. Can a slasher be used with a Farmall A. 3 point linkage? I’m after information on how to fix the hydraulics of a 1947 McCormick super A TRACTOR. I have a farmall super a tractor with a serial # of 6530 DD. Can you tell me what year it is? seat bracket but still cant find a number. Another web site said its near the front steering arms. No luck. Called Farmall parts to order an owners manual and was told it may be stamped on housing under the battery box but that number is not in same number series as the list of serial numbers I found on line. Like the man said if you want a tractor with a serial number plate buy a tractor with a serial number plate. These tractors have been in our family since the 70’s. My husband passed away two years ago and he took all the knowledge and know how with him. I KNOW HIS IS STILL TENDING A GARDEN IN HEAVEN. I am looking for a parts catalog for a 1949 Farmall Super A. I am restoring it and I need a lot of parts but have to start one by one. Could you tell me a phone number to call to get the catalog? I have model FAA – serial no.346154. Max RPM 1540. Any information on this tractor very thankful. I was wondering what weight of oil goes in the steering box that i just rebuilt on a 1952 super a international tractor.